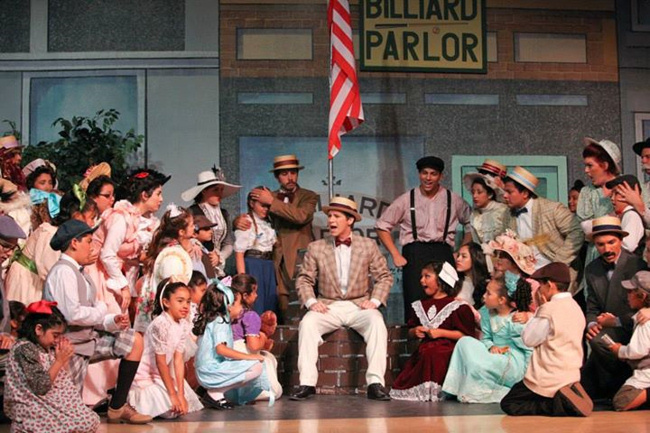 Book, music, and lyrics by Meredith Willson, based on the story by Willson and Franklin Lacey. Debuted on Broadway in 1957. It looks like an idyllic day in the small town of River City, Iowa for the Fourth of July in the troubleless year of 1912. But they�ve got trouble with a capital �T� when slick con artist Harold Hill arrives on the train. Despite not knowing one music note from another, he promises to solve all the town�s problems by forming a boys� band, selling instruments and uniforms to the eager River City citizens desperate to stave off the looming crisis represented by the presence of the first pool table in town. Hill�s planned everything down to the first train out of town following delivery of the uniforms. But he couldn�t plan on the town�s piano teacher, Marian the librarian. This slice of Americana includes such standards as Seventy-Six Trombones, Ya Got Trouble, Gary Indiana, and Till There Was You. 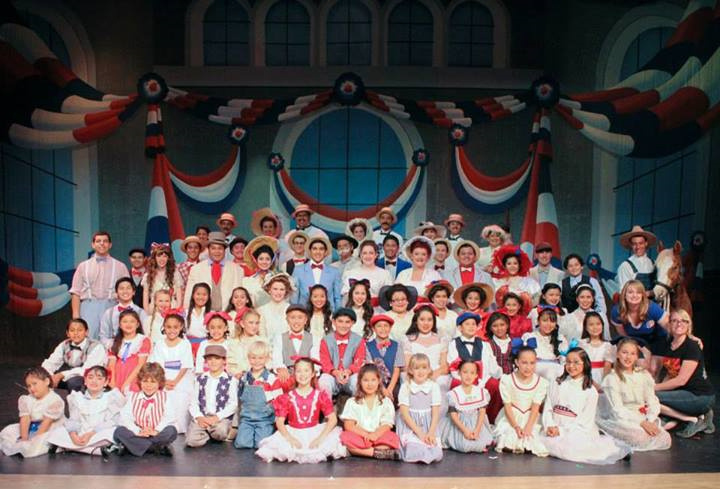 Top Billing Entertainment put on a huge production of The Music Man in Baldwin Park, California directed by Kristina Keener Ivy. 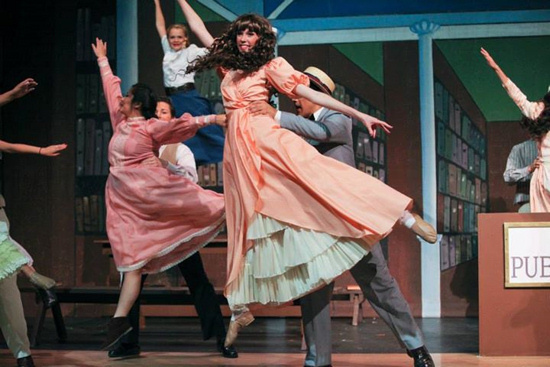 Kristina adds great touches throughout, from the opening scene as the train passengers start filing into the train car, offering their tickets to the conductor, while train vendors hand out refreshments to some of the audience members, to the added Music Man megamix during the bows that allows several ensemble members a chance to shine with solo parts. 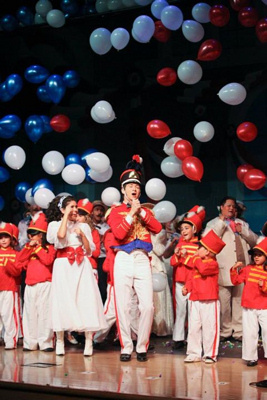 The director pulls double duty as the costume designer, her beautiful, creative, and wide variety of turn-of-the-century outfits focused on the red-white-and-blue. These are topped off by some superb hair styling and wigs by Hillary Chavez, which along with the backdrops and sets (Set Designers Fernando Cruz and Tom Ivy) all add much to the show�s impressive visuals. Wearing those costumes and hair styles is a large cast that has many of the principal roles double-cast. Timothy Jackson leads one cast with good charisma as salesman Harold Hill, teaming up for an amusing The Sadder But Wiser Girl song-and-dance with friend Marcellus (Joseph De Los Reyes) who humorously channels his inner woman, and teaming up with his Marian in several memorable moments including a beautiful Till There Was You in which Timothy�s wordless reactions capture his transformation perfectly. Suzanne Boles is his Marian, filling the role with a great, natural personality that is strong and funny and real whether she�s getting hit on in a library or hit on by an anvil salesman with troubling news, or suddenly finding herself popular amongst the formerly disapproving Pick-A-Little Ladies. 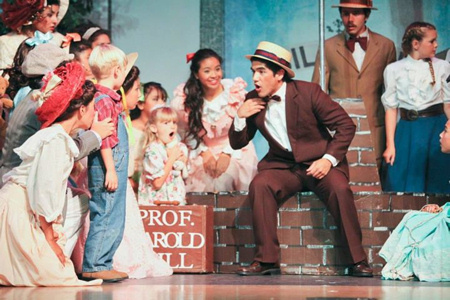 Christopher Cruz is the professor for the other cast, also a good salesman with an impressive singing range (wide enough to demonstrate different pitches for the cast�s excellent barbershop quartet), and nailing the scene in which he finally stops running. Stopping him in his tracks is Kathleen Moriarty as Marian played with both nice personality and stunning vocals highlighted in My White Knight and Till There Was You. Andrew Zubiate is a terrific comedian as Marcellus Washburn whether playing off Professor Hill or getting the town going with some Shipoopi. 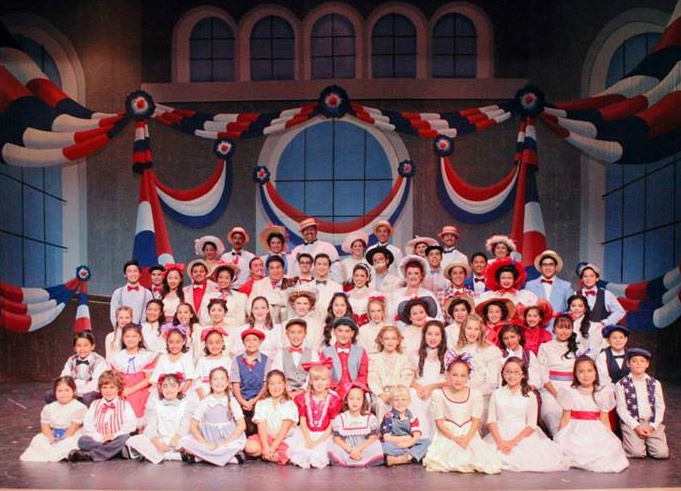 The cast boasts a wide range of ages, including some good adult talents such as Hillary Chavez as Mrs. Paroo, Elder Timbol with great comic instincts as Mayor Shinn, and Sarah Alonzo as his dance-happy wife Eulalie. 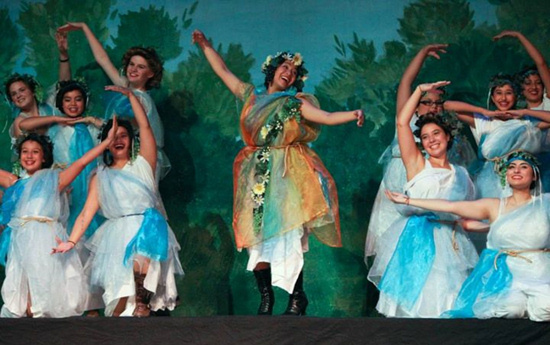 High school student Clarisse Torres is the other Eulalie, and she is a hoot leading the delightful Pick-A-Little Ladies and the interpretive dancing Grecian urns, and showing the professor where a woman�s heart should be located. 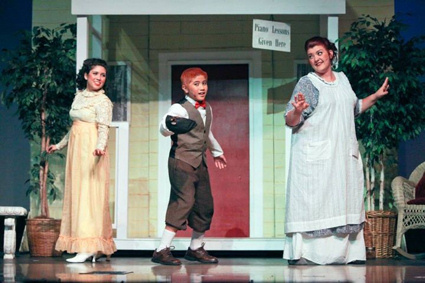 As Winthrop Paroo, Jacob De Los Reyes delivers with Gary, Indiana, and gains a big laugh when his mom claims, �Why Professor, we are Irish!� and non-Irish-looking Jacob De Los Reyes turns to greet the audience with a huge, ironic grin. 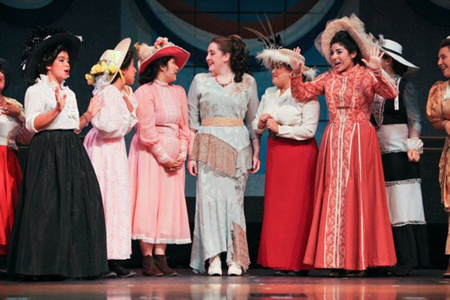 Jacquelyn Flameno and Samantha Morelos (who also plays the piano for her scene) are cute as the Amaryllises, and the Zaneetas (Angelica Flameno and Summer Barratt) and Tommys (Richard Dayle Reyes and Christian Sandoval) do a nice job leading the town�s younger generation. The ensemble shines in several big scenes including the readers/dancers in the nicely choreographed (Choreographer Jamie McMahon) Marian the Librarian, welcoming the Wells Fargo Wagon (led in by a real pony by the name of Mr. Bubbles), as deeply troubled River City citizens, and as an eager �children�s band� led by 76 Trombones.